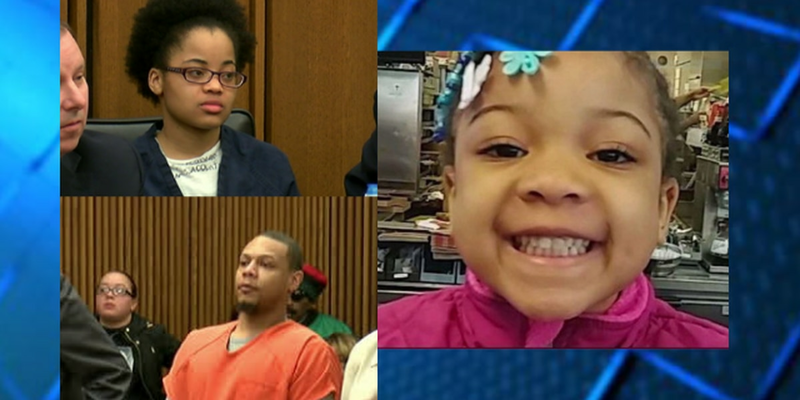 CLEVELAND, OH (WOIO) - Sierra Day, the mother of slain Aniya Day-Garrett, and her boyfriend Deonte Lewis were both sentenced to life in prison for the murder of the 4-year-old girl. Day was sentenced without the possibility for parole, while Lewis will be eligible for parole after serving 20 years in prison. Both were found guilty on eight charges that include aggravated murder and permitting child abuse. Judge Timothy McCormick, who presided over the couple’s trial, sentenced both during Wednesday’s hearing. “In my 24 years, I don’t think I’ve seen such a callous disregard for human life that Sierra showed Aniya,” McCormick stated before delivering the sentence. Mickhal Garrett, Aniya’s biological father, addressed the courtroom with a victim impact statement while standing before Day and Lewis. “Sierra Day, Aniya’s birth mother, how could you torture and murder your own flesh and blood. Your daughter, my beautiful princess, my angel, my perfect Aniya,” Garrett said. Day did not speak, but her boyfriend did address the courtroom after his attorney’s request to dismiss all of his charges was denied. His words of “I loved Aniya” fell on deaf ears. They rang hollow because he watched as she suffered a slow starvation that reduced her to skin and bones. Day refused to ask for mercy, choosing not to comment when the judge asked her. Thirty-eight witnesses were called to the stand during the murder trial that spanned six days. The jury delivered a guilty verdict less than 24 hours after closing arguments concluded. She was taken to Euclid General Hospital where she was pronounced dead.